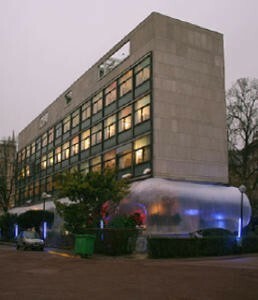 The Fondation Suisse in Paris is the most prominent dormitory of modern times. To mark its 75th anniversary, German Architecture firm Raumlabor Berlin was commissioned to find a temporary solution for a recurring problem: the missing space for big festivities. In summer the terrace called “piloti” underneath the building would have been perfect, but in November it was too cold. Raumlabor Berlin proposed to wrap the space with an inflatable, translucent PVC membrane and thereby transform the semi-public ambience to semi-private. For three days the pneumatic hall was home to concerts, speeches, dinners, a conference and a party.